Figure 8.26: A mayfly larva that often drifts at night. One of the simplest and safest strategies for an insect to avoid being found is to avoid being out and about when their predators are out and active. That way predators never find them in the first place! A good example of this occurs in some insects that inhabit the bottom of streams, like mayfly larvae. 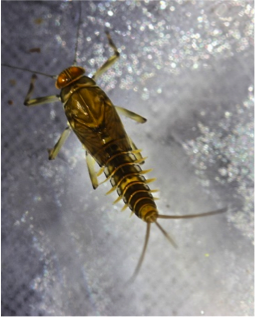 Mayfly larvae often move from one location on the stream bottom to another location by drifting (they release from stones and float in the water column until they find a new home). Studies have shown that most mayflies drift at night. Why? One of their biggest predators are trout that feed on insects that are floating in the water. Trout encounter prey using vision so mayflies are much less likely to be encountered and eaten by trout if they move around in the dark. Fly fishermen use this idea all the time because the flies that they use mimic these aquatic insects and cause the trout to strike. Figure 8.27: Aphids feeding on the underside of a leaf. Another good strategy is for insects to hide or be active in places where predators cannot find them. 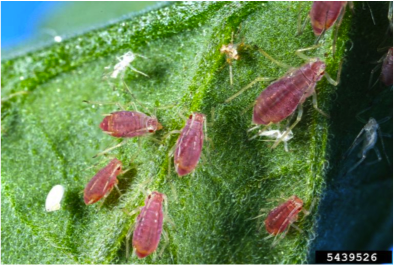 In Figure 8.27, aphids are seen feeding on the undersides of leaves, making them less vulnerable to visually-based predators like birds. They feed by piercing the leaf tissue and sucking out the contents. However, it does not make them less vulnerable to all predators. Figure 8.28 shows a ladybird beetle eating an aphid. Aphids are common garden pests so the next time you are in the garden check the undersides of leaves on roses, tomatoes etc. You may find some aphids. 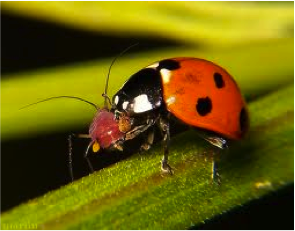 Ladybird beetles are voracious predators and are often used for biological control of insect pests like aphids—insects don’t always have to be the prey, some are predators too! Figure 8.28: A ladybird beetle feeding on an aphid. Not all insects have the luxury of being able to hide from predators. Perhaps their life styles require that they be out and about at the same time as their major predators. Insects that are camouflaged can hide… in plain sight! Camouflage is most frequently achieved by coloration or shape that blends in with the insect’s background. 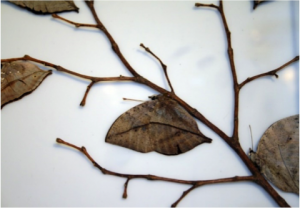 Check out this Insect Camouflage site from Noth Carolina State University. Can you find the camouflaged insect? If you open each picture and then click on it with your mouse you can remove the background and reveal the insect. 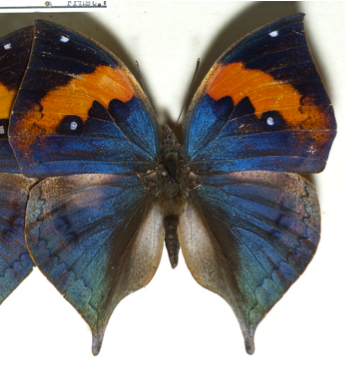 Figure 8.29: The dead leaf butterfly (Kallima inachus) with wings open. One type of mimicry is a form of camouflage, but instead of trying to blend in to the background, the insect is disguised as something inedible or uninteresting to a predator. For example, the dead leaf butterfly (Kallima inachus), a tropical species, looks just like a dried leaf when it is at rest and its wings are folded up. The upperside of this butterfly’s wings are brightly and beautifully colored. Camouflage and mimicry are often accompanied by behaviors that make the disguise more convincing. For example, when its wings are folded and it is resting on the twig, the wings flutter in the breeze, making the impression much more profound. Figure 8.30: The dead leaf butterfly hanging on a twig with wings folded.